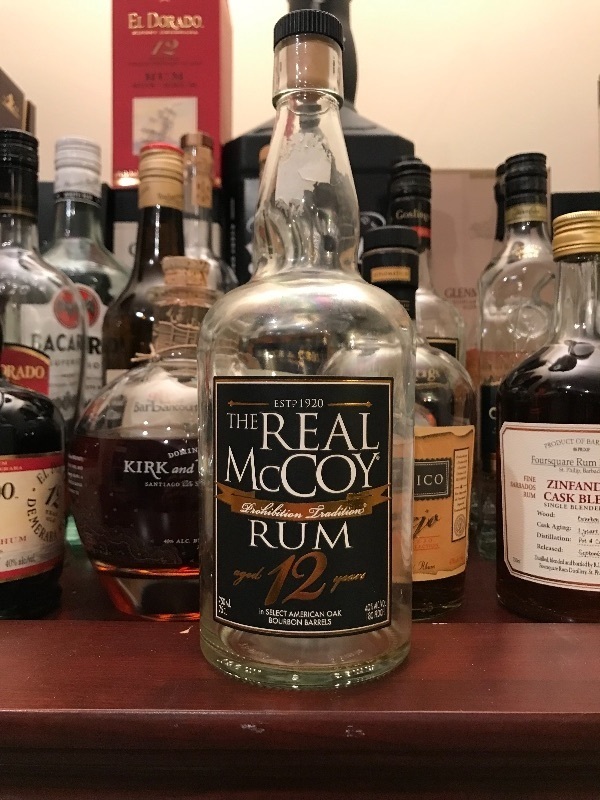 Have you found an online vendor selling The Real McCoy 12-Year? Another great bottle from the island of real rum.This one get straight to the point and is a little more heavily bodied then you usual Barbadian. My nose fills with notes of leather, oak, coconut and pepper. In the mouth I pick up a dark character with notes of oak, leather, tobacco, orange-peel and spices. Despite the manly character, it's a pleasingly refined rum that's well executed. The taste and color feels heavily influenced by the barrel, but it never goes overboard. Thumbs up. This is a great 12-year-old Bajan rum with no added sugar. Along with the other offerings from Foursquare and Mt. Gay, this makes for a fantastic "benchmark" sipping rum, with notes of oak and dry caramel. Took a few minutes to open up, but once it did, it was very nice, indeed. I think it has quite a bit more character than the NAS MGXO, and is a little dryer than RL Seale's Finest. This is probably also the smoothest of the bunch. To me, RM12 competes with Foursquare's cask series, just without the level of nuance/interest those ones offer. Compared to the already-excellent Real McCoy 5-year, the taste is very similar, making it difficult to justify the extra expense of the 12. The 12-year is slightly smoother, and has a richer nose of brown/demerara sugar. The 12 is clearly a more refined/enjoyable sipping rum, so grab it if it's within your budget, but I was surprised at just how good the 5 was, so feel no regrets about trying that one instead if your budget's tighter (or if you want an exceptional mixer). I was on the fence about trying this one after reading the reviews, but finally decided to give it a try. If I had to rate it right out of the bottle it would be lower. I inadvertently let this one sit in the glass for 30 minutes while I was distracted. When I got around to trying it I was pleasantly surprised. Not to overbearing or sweet and very smooth. A nice sipper. Tried another glass without the wait and it was good but not quite like the first. Give it a try but let it sit a while. the rum is good, great color, but I think it's overpriced. I'm generally not a fan of rum aged in bourbon, but this is nice because it still has a touch of rum sweetness (though I wouldn't mind a little more sweetness). Tastes and smells of oak, bourbon, caramel, a light spice, and smoke. Very smooth. A great rum for the money. Sugar test-0. Well duh, it's from Foursquare! Conclusion: An authentic, honest Barbados rum of 12 years in barrel without sugar additives. Complex nose and palate with a quite long afterburn for a Bajan rum. R.L. Seales and the Foursquare distillery has some different brands aged 10-12 years. I have some of them (see picture), but haven’t tested them against each other. Must do that sometime. I’m quite sure that the Real McCoy will come out as a top brand. Another high quality rum from Barbados. The Real McCoy 12yr has a tobacco forward profile which is great to pour your friends who think rums are all overly sweet. Ein schöner Rum ohne Zusätze. Fruchtige Noten im Anklang gut eingebautes rauchigea Holz und eine dezente Süsse. Dazu die tolle Geschichte vom Captain Bill McCoy. I started as a whisky drinker so The Real McCoy 12 was right up my alley. Nice hints of oak and vanilla. A little bit of more pepper than you would expect after you swallow, but overall a damn fine rum. Perfectly acceptable but not memorable. A bit too sweet for my taste. This is the first rum I drank neat. I was surprised at all of the flavors I experienced while sipping. Brown sugar, vanilla and butterscotch are the most prominent to me. 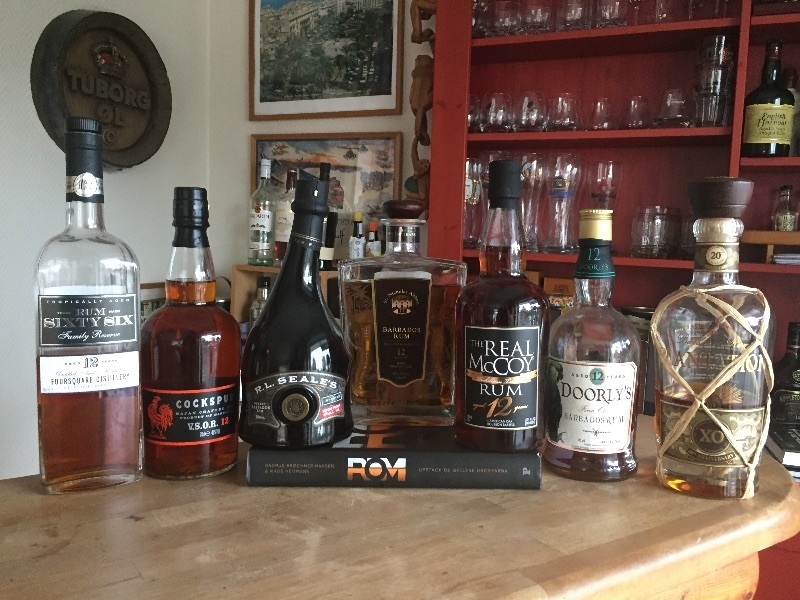 Adding a few drops of water really brought out the different flavors, but I know there is much controversy about adding anything to a glass of rum. Reasonably priced as well. A definite winner. I am by no means proficient enough to properly dissect the complexities and flavours in this bottle, but I can tell you that what I taste is one of the better rums that I have tasted. Well worth the cost and easily enjoyed over a block of ice. A new permanent addition to my stock. It is dry properly aged rum with sweet wood nose and a bit of a plume flavor, but the background hides some soap that prevents it from getting higher score. The burn is moderate, maybe quite high for 12y aging. This is probably on the sweeter side of the rums I tend to like. Goes down very smooth. You'll be able to taste the oak and vanilla for sure, it's somewhat of the finish to it. They could use a different name though, because when I've recommended this to others I get a stink-eye at the name. this is tremendous. so much barrel and bourbon character and yet the molasses flavor and spice aren't lost. delicately sweet without being cloying. one of the better rums i've had. Having enjoyed a bottle of The Real McCoy 5 yr rum it was time to open up a bottle of The Real McCoy 12 yr rum. Being produced by Foursquare Distillery I had great expectations and was not disappointed. This rum is smooth, unadulterated and is right up my alley. Not quite a “10” but certainly a 9+ rating. Well done Mr. Seale. I enjoyed this one. Strong and complex flavors with bourbon notes. If you like bourbon and want a good crossover, this is it. Reminds me of Appleton 21yo. Stronger burn with tones of raisines. Nice aftertaste with cocoa. A good blend of barbadoan, blackstrap molasses rum aged for a minimum of 12 years in heavily charred, American oak ex bourbon casks. It's a quality sipping rum the really encapsulates Barbados in a glass. Aromas of tropical fruit and spice fill the nose enveloped by smoky oak. It's a sipper through and a decent one at that. Wonderful flavour too smoky and oaky but undercut by touches of tropical fruit, cacao and spice very subtly balance the liquid. No added sugar in this rum either the sweetness comes purely from the blend. Coming in at £44 It's a little pricy in my opinion and for rum schooner history I would favour the kirk and sweeney 18. Ikke lige mig, er mere til de søde rom. Men den smager bestemt ikke dårligt, og er en ganske fin rom at sippe. Umiddelbart finder jeg Vanilje, Kokos, appelsin og tobak. Den efterlader en olieret fornemmelse i munden, hvor man kan smage den lidt mere søde eftersmag.